Strahl, S.; Husar, A.; Riera, J. Experimental analysis and CFD modeling is used in this work to analyze system efficiency related to hydrogen purge based water management in an open-cathode PEM fuel cell system. Excess water in a deadended anode decreases hydrogen concentration at the active catalyst surface and thus causes fuel cell performance losses. Purging the anode with hydrogen removes water and nitrogen that diffused through the membrane but also means wasting energy and thus decreasing overall system efficiency. Experiments with a 100W open-cathode stack have revealed that the need for a hydrogen purge strongly depends on the operation conditions and the state-of-health of the fuel cell and therefore the decision to perform a purge has to be evaluated online. A dynamic 2D CFD model of a single cell within the stack is used to investigate water distribution and transport within the cell before, during and after performing a purge at different operating conditions, linked to cell performance. Moreover, the model is capable of studying water transfer dynamics across the membrane and along the channel, including liquid water saturation. Altogether, the presented experimental and modeling work helps to improve the understanding of water transport in a PEM fuel cell and thus facilitates the development of strategies for increasing system efficiency and optimizing the water management by properly controlling the hydrogen purge. Strahl, S.; Husar, A.; Riera, J. 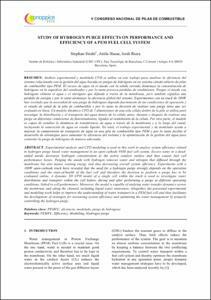 Study of hydrogen purge effects on performance and efficiency of a PEM fuel cell system. A: Congreso Nacional de Pilas de Combustible. "Proceedings of the V Congreso Nacional de Pilas de Combustible - CONAPPICE 2012". Madrid: 2012, p. 1-4.